Twenty years later, the director, producer, writer and many players recall working on hockey’s greatest action movie. Sudden Death smashed its way into movie theaters in December of 1995. The film starred Jean-Claude Van Damme, who saves a hockey game from a terrorist bomb threat. But this wasn’t just any game – this was Game 7 of the Stanley Cup Finals between the Pittsburgh Penguins and the Chicago Blackhawks. The producer and the writer of ‘Sudden Death’ were also the owners of the Penguins during the mid-1990s. Howard Baldwin produced the film, based on a story written by his wife, Karen Elise Baldwin. ‘Sudden Death’ was shot at the old Civic Arena, a.k.a. “The Igloo.” Many notable Penguins’ personalities make appearances. Superstar Luc Robitalle is in ‘Sudden Death,’ as are ex-Pens Jay Caufield and Mark Kachowski. Up in the broadcast booth are play-by-play announcer Mike Lange and color commentator Paul Steigerwald. Heck, even team mascot Iceburgh is in one of the film’s most iconic fight scenes. Van Damme – who did not respond to interview requests for this article – plays Darren McCord, a former firefighter who suffered a meltdown and is relegated to the role of a fire inspector. He just so happens to be working at Civic Arena during the Finals, and uncovers a terrorist plot involving bombs and hostages. HOWARD BALDWIN [PRODUCER/PENGUINS OWNER]: We wanted to do a movie that had a good story, but if it had hockey in it, then that’s all the better, right? And that’s really what we tried to achieve. KAREN ELISE BALDWIN [WRITER/PENGUINS OWNER]: I was an actress, and then I started writing and producing. We had the Penguins, we had access to Civic Arena, and the building was unique in that the roof opened up. One day, I said “What if we do something like ‘Die Hard’ in a hockey arena?” I thought that would be a lot of fun because the building is so unique and at that point in time, there were a lot of Die Hard-type movies. 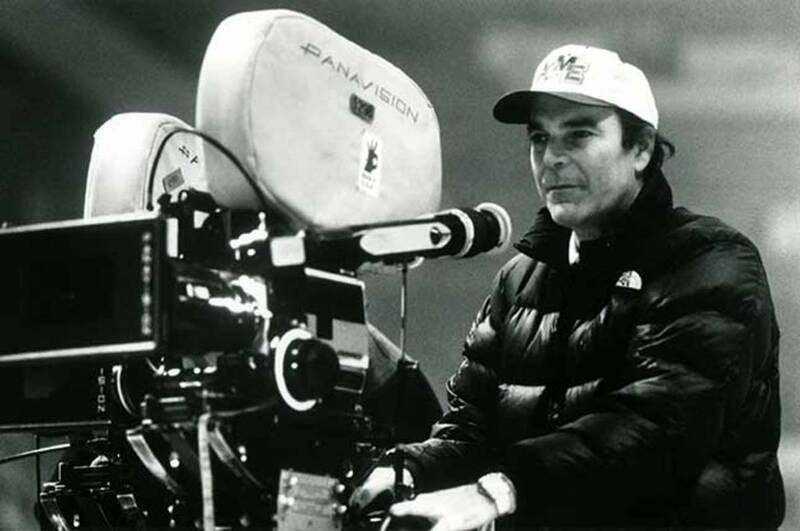 PETER HYAMS [DIRECTOR/CINEMATOGRAPHER]: I was not a hockey fan. I had not been to a hockey game before. I started to do research, and then I started to watch the Penguins play. I began to realize the unbelievable athleticism involved, and the violence involved and the speed of that puck. Hockey is better in the arena than it is on television. It’s a phenomenal sport. KAREN ELISE BALDWIN: Peter read the script, and said “God this is wild, but they’re never going to let us use the building or their hockey team.” When he found out that we actually owned the team and played in the building, he was on board. Early in the film, McCord takes his son Tyler to the Penguins’ locker room, where they meet superstar Luc Robitalle. 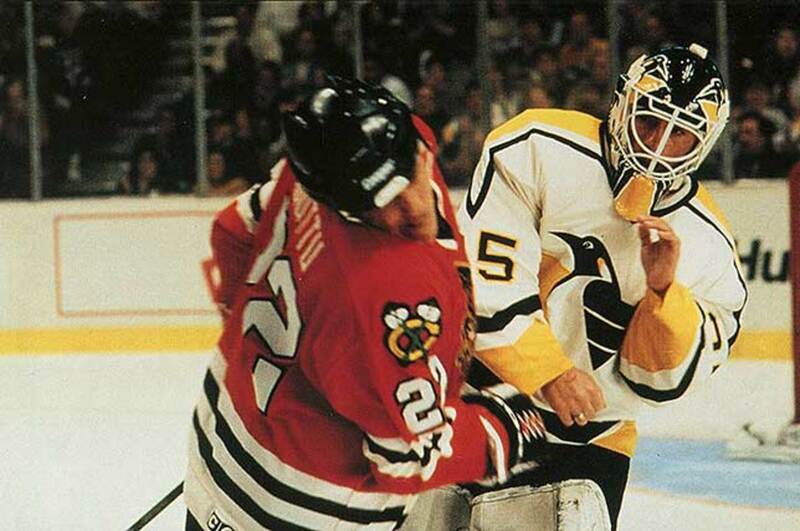 They also have an encounter with the Penguins’ moody goaltender, Brad Tolliver — memorably played by ex-Pens tough guy Jay Caufield. For Caufield, now a studio analyst for Penguins’ TV broadcasts, this was his first on-screen work. KAREN ELISE BALDWIN: Luc and I had acting classes together, back when he was with the Kings. And we had the same manager. So, I was a good pal with Luc. He had a bit of an advantage in getting a part. NANCY MOSSER [LOCAL CASTING/EXTRAS CASTING]: The challenge for the role of the goaltender was to get someone who was missing teeth and could play mean. Someone originally suggested (ex-Pittsburgh Steelers linebacker) Jack Lambert, but he really wasn’t interested. So (hockey consultant) Dee Rizzo suggested Jay Caufield. JAY CAUFIELD [BRAD TOLLIVER]: I had just retired from the sport. I got a phone call from Nancy, and I initially said that I did not want to do it. I think I just wanted to stay away from hockey in general. My wife wanted me to look into it. Nancy called me again, and I said I’d try it. MOSSER: I think Jay was really nervous. He was very reluctant. We went through the lines a couple of times, and I said “Jay, you are really good. You can do this.” And then I put him on tape and of course they loved him. HYAMS: [Caufield] was very eager to try and do it well. He’d smile and was missing a couple of teeth. He had shoulders the size of Pennsylvania. He was a lot of fun to work with, as was Luc. For them, it wasn’t a home game. For them, it was an away game. They were trying to please and do a good job at something which they weren’t familiar with, in making a film. KAREN ELISE BALDWIN: When Jay did his lines, he was so good they added more lines to his part. MARK KACHOWSKI [PENGUINS PLAYER “BEAUMONT”]: I remember Van Damme talking to the director about his lines with Jay, and saying “He’s so big and intimidating.” Jay is just a big man. According to multiple sources, Caufield was supposed to appear shirtless in the scene, so as to appear more intimidating, but Van Damme insisted that the ex-NHLer not appear bare-chested. Meanwhile, the Baldwins had secured permission from the NHL to film the Penguins’ home game on October 1, 1994 against the Chicago Blackhawks. The plan was to use footage of that game’s action, as well as the crowd, in what assuredly would have been a sellout. Then a lockout ultimately cancelled the first half of the 1994-95 season. KAREN ELISE BALDWIN: We thought it would be easy – we’d just use our own crowd during a game. Because of the lockout, we had to scramble and figure out how we were going to achieve two teams on the ice and a building full of people. HOWARD BALDWIN: The lockout didn’t make our lives easier. We had to jump through a lot of hoops in order to get through it, but we did. To get some hockey and crowd footage, the Pittsburgh Penguins played an exhibition match against their minor league team, the Cleveland Lumberjacks in October of 1994. The Lumberjacks were outfitted in Blackhawks uniforms. HOWARD BALDWIN: I had a good relationship with (NHLPA Director) Bob Goodenow, who said it was OK if the Penguins wanted to play in this exhibition game. IAN MORAN [LUMBERJACKS PLAYER]: I wore Chris Chelios’ jersey, probably because I’m a right-shooting defenseman. They tried to make it look as real as possible. MOSSER: I had to cast 10,000 extras. Those were paid, booked extras that we had to call and tell them what to wear. KAREN ELISE BALDWIN: Obviously, there’s a difference between a real NHL game and something that you’re trying to make look like an NHL game. MORAN: Basically, it was like a shinny hockey game. It was pretty easy going. They set up some face-offs here and there. It wasn’t a full game, obviously. There wasn’t any real intensity to it. It was a fun night. The mock game between the Penguins and Lumberjacks wouldn’t pass for the Stanley Cup Finals, perhaps because players on both teams were on good terms with one another. So another scrimmage was staged in January 1995, using two ECHL teams. The Wheeling Thunderbirds and Johnstown Chiefs played each other at Civic Arena, wearing Penguins and Blackhawks uniforms. However, much of the hockey action seen in ‘Sudden Death’ utilized the talents of numerous local-area hockey players. Most of the close-up or distance shots, as well as key goals, saves and body checks in ‘Sudden Death’ were performed by local ex-college or ex-pro players, with a few beer leaguers in the mix. Most were paid $125 a night for upwards of a 12-hour shift and were on-call over a four-month span. Players were either on the ice or waiting around for hours at a time. HYAMS: There were a number of shots at ice-level. We had to figure out ways to get the cameras to move quickly. Regular dollies wouldn’t work, so we essentially had cameras on skates that we could pull and move at the speed that people were skating. I was trying very hard to make people feel like they were in the game. JIM “MORT” MCVAY [PENGUINS GOALIE]: We had call times of 10 or 11 at night, and go until 7or 8 in the morning. We had regular jobs, but it was so much fun to stay up all night, drink Coke and coffee, and then go to work. We’d play four or five hours a night. No one ever gets four hours on the ice. It was just such a unique thing to be one of the hockey players. DEE RIZZO [HOCKEY CONSULTANT & BLACKHAWKS PLAYER]: I played with Chris Chelios on the Junior Olympic Team. He took me under his wing. I always remembered that. So when I was brought on for this movie, I wanted to wear Chelios’ jersey. I should have done my homework and asked to be a Penguin because they got all the speaking roles. But it’s all good. PHIL SPANO [HOCKEY CONSULTANT & PENGUINS PLAYER]: The stunt guys coached us on how to protect ourselves. The first hockey stunt we did was me getting checked [face-first] into the glass by Dee. We had a crosshair drawn into the glass. We were skating fast, but had to find that spot on the glass, and coordinate it so you didn’t get hurt. It took six or seven takes before we got it right. As soon as I was done, I asked the medic for four Tylenol. BOB BLACK [BLACKHAWKS GOALIE]: They needed a goalie that had upper skill level and would be about the same size as Eddie Belfour. Fortunately, I fit those requirements. I wore Belfour’s secondary set of equipment. It was exciting to put on his mask. You could really let your imagination go. We had guys on the ice like Luc Robitalle and Mark Kachowski. It was almost like, if you didn’t play pro hockey, this was the next-best thing. MCVAY: There were about 15 to 20 hockey players there per night. There was a snack table. We’d come off the ice and we would sit together. If Van Damme came over, his assistant would tell us all to move 10 feet away from the table. KACHOWSKI: I had the guy with the boom microphone and tape recorder follow me around on the ice one night while everyone else was in the locker room. Stops and starts, shooting pucks against the glass, shooting pucks against the boards, shooting pucks against the goalposts. Do it again, stop, turn, turn, turn. I got a pretty good workout in. SPANO: We were kind of like a SWAT team – we went in and did our thing. We were in a very specialized role. A lot of the hockey action is in the background, so you had to maintain the realism of the game without ever taking focus away from the action in the foreground. MCVAY: One night, we didn’t do anything except play cards. Somebody got into a super box and figured out that the refrigerator was still full of beer from the season before. RIZZO: About five or six of us went upstairs and got into the boxes in old Civic Arena. We jimmied the locks on the refrigerator doors. We figured if we weren’t shooting, we’d just get hammered. We went from suite to suite and jimmied all of the refrigerator doors open and drank all night just to kill time. KACHOWSKI: Beer was snuck down into the locker rooms, somehow. I remember that: sitting around, playing cards, having a few beers. RIZZO: When you’re [drunk], and you’re tired, you’re really giddy, and you’re laughing. So, we bonded a lot, the guys. It brought us all closer together. What a great experience that was. BLACK: One night, they took a break from filming, and the director said to me “Listen, we need to keep [the audience] entertained. Would you mind fighting Iceburgh at center ice?” I agreed. Everyone else was off the ice. I skate by Iceburgh and he pushes me. So I push him back. I drop my catching glove, jump on top of him, and pretend to hit him with my blocker. I forgot that I was in a Blackhawks jersey, and so the crowd is booing me. The guy in the costume is yelling at me to let him win. Finally, the crowd was booing so loud I agreed to let him beat me. How often do you get yelled at by a guy in a penguin costume? Up in the broadcast booth are two Penguins’ mainstays: Mike Lange, calling the play-by-play, and Paul Steigerwald adding color commentary. To get natural-sounding play-by-play, hockey footage was edited together and shown to the duo. MIKE LANGE [PLAY-BY-PLAY ANNOUNCER]: After calling a game [in early 1995], we had to stay after to film our scenes. We had fun doing it. I got a lot of memories, though I don’t remember much of it now (laughs). PAUL STEIGERWALD [COLOR COMMENTATOR]: We were calling the game off of a monitor. The game was on film, not on video, and had to be cranked by hand to play. Mike really had to carry the ball, because he’s calling the game. I just popped in with a phrase or two. LANGE: It was a challenge, because the players were [mainly] local people. They had NHL jerseys on, but were completely different than who it would normally be. When you do play-by-play, you learn players’ tendencies. It became quite a challenge with all these guys who were playing someone else. But jersey numbers helped the cause for dummies like me. STEIGERWALD: [Mike’s play-by-play] was a really important element in that movie. Important to creating the feeling that you were at a game, that the game was ongoing while all this other stuff was taking place at the arena. In one memorable scene, McCord gets into a fight to the death with the Penguins’ mascot, Iceburgh – or more specifically, a villainous henchwoman disguised as Iceburgh. KAREN ELISE BALDWIN: That was Peter’s idea. I really trusted him, and he pulled it off. It was a crazy idea, but it was one of those crazy ideas where as soon as you saw it, you knew it was going to work. HOWARD BALDWIN: There wasn’t any hesitation on my part. It’s a movie, and it’s fun. Nobody is going to think our mascot does that in real life (laughs). HYAMS: I thought to do a really violent and dangerous fight between a guy and somebody as ludicrous as a big penguin. I thought it was cinematic and in some respects funny in a very unfunny situation because the penguin itself was a very lethal person. And I just thought the juxtaposition of putting that kind of lethal violence of a man fighting for his life with somebody dressed as an adorable penguin, who turned out to be murderous, just seemed to me to be both cinematic and funny. KAREN ELISE BALDWIN: When you look at movies in the 1990s, you could get away with a certain amount of camp, quippy one-liners, that sort of thing. HYAMS: I can’t defend silly ideas that I have except that I think it is an idea that worked. I thought it would be funny when the hero punches the face of the mascot, and it has no effect. After that, I thought to make the fight as lethal as you can make it, and then you have something that is maybe original. KAREN ELISE BALDWIN: The origin of that idea was from a story my husband and I developed called Red Line, about a Soviet goaltender who is able to defect because he’s wearing his mask. That project never happened, but I took that element and used it here. It’s far-fetched, but you know, at this point the whole thing is a little far-fetched, so you either go with it or you don’t (laughs). BLACK: Peter asked me to help dress Jean-Claude in goalie equipment. He’s not very tall, and the Penguins’ goalie pads were big, but that’s what they had to work with. Goalie skates aren’t very comfortable if you aren’t used to them. Van Damme steps off the trainer’s table, walks maybe 15 feet towards the ice, turns around and says “Get this stuff off of me!” So, we had him take the goalie skates off [for some scenes], and I showed him how to shuffle, how to make it look like he was skating. But he had tennis shoes on. HYAMS: The thing I imposed on that scene is the signing of “I love you.” We were watching Sesame Street when my sons were little, and one of them said “I love you” to me in sign language. That is how I said “good night” to my sons every single night of their lives. To this day, it is how we say “see you later” to each other. I wanted to put that in the film. [McCord] is pushed into this ridiculous situation, where he is way over his head, and he makes this save. Then, to bring it back to earth, he signs “I love you” to his son. McCord grabs a nearby Blackhawks player and punches him, setting off a brawl and getting ejected from the game in the process. Later, Luc Robitalle scores a game-tying goal for the Penguins in the closing seconds of the third period, sending the game to — wait for it — sudden death overtime. KACHOWSKI: We had a huge fight scene. They cut out most of it. That was fun to shoot. The guys made it look pretty good. Toward the end of the film, McCord brawls with a thug on Civic Arena’s domed roof, which is partially retracted. Meanwhile, the Blackhawks and Penguins – and thousands of fans – are oblivious to the violence taking place above. BEGGY: One camera angle that really stuck out in my mind was one that starts at ice level and goes up in the air, then slowly turns to the roof where there is a fight. They had a camera guy on a little stool with a rope attached to it. And the rope went up to a pulley attached to the ceiling of Civic Arena, then down to the bumper of a pickup truck in the parking lot. When they called “Action!” the truck would drive across the lot and pull the camera man up. I thought it was really clever, and risky, but it was pretty cool to witness. HYAMS: One big challenge was, we didn’t always have 10,000 extras. We wanted it to feel like a full stadium. So we had a couple thousand people that would move for each shot, and 10,000 cutouts of people. I would sprinkle real people within the cutouts so that there would be movement. BLACK: They were filming the fight scene on the rooftop. The helicopter [with the camera] was huge. You could feel the wind from the blades on the ice starting to swirl around the boards. All of a sudden, sections of these cardboard people start catapulting hundreds of feet into the air, and then they’re spinning down to the ice. My jaw just dropped. MOSSER: The cardboard cutouts sort of became a personality of their own. They looked pretty real. They were really effective until the wind came and moved them. People had to scramble to set them back up again. Everybody worked so hard to get those seats filled. 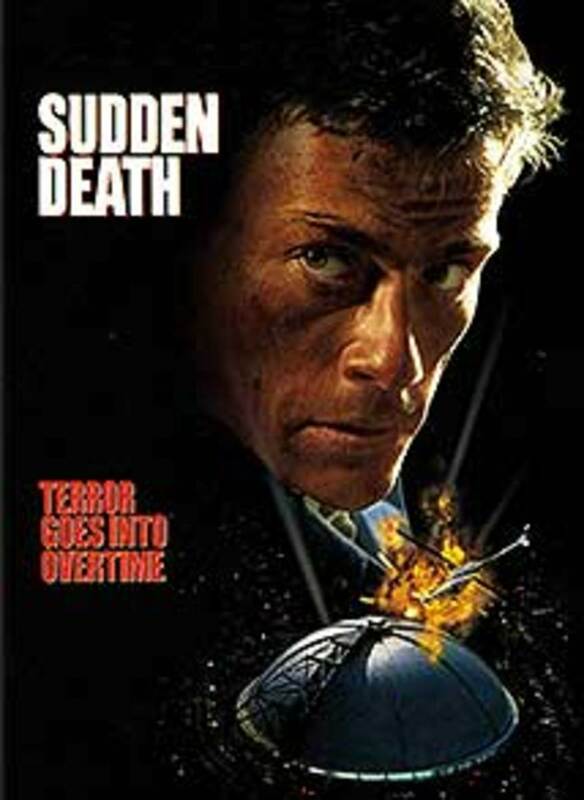 ‘Sudden Death’ was released in theaters on December 22, 1995, back in an era when most movie theaters were closed on Christmas Eve and Christmas Day. It also faced some tough competition at the box office and made around $20 million during its theatrical run in the U.S. However, it made another $44 million worldwide, and became a popular staple for cable TV and in video rentals and sales. KAREN ELISE BALDWIN: When you create something, and then actually see it on the big screen, it’s an amazing feeling. People watch it and are able to see your ideas fulfilled. CAUFIELD: People still bring up Sudden Death, especially in Pittsburgh. STEIGERWALD: I still get checks for my appearance, for about $3.74, whenever ‘Sudden Death’ airs on a cable channel somewhere in Europe. LANGE: I went into a convenience store one day, and a gentleman behind the counter who I hadn’t met before recognized me. He didn’t speak any English, and he starts moving his hands like an old-time movie projector, and saying “John Wayne, John Wayne.” He had seen ‘Sudden Death’ in Pakistan. HYAMS: I really learned to appreciate the sport. And I loved working with Howard and Karen. They are nice people in a business where you don’t really find nice people. To this day, I am a Pittsburgh Penguins fan. Although I am from New York, so I will still root for the Rangers. RIZZO: After the movie was done, we kept the [hockey] group together. We’d get together once every week or so and play pickup hockey together. We did it regularly until about five years ago. We only did it once last year. It’s harder now that we’re all older, with families. SPANO: Years later, I got work as the hockey coordinator for ‘She’s Out of My League.’ Having that opportunity tells me I did my job well the first time. CAUFIELD: One thing I remember is when we were filming a scene where my character was sick and I had to throw up. I did it, then I kind of giggled, and then everyone in the room giggled. Peter walked up to me, and I don’t know verbatim, but said if you’re going to do it, do it the best you can; don’t do it halfway. I appreciated that. It made sense to me. That stuck with me more than anything over the years.